With the possible exception of the table saw, a wood router is the single most versatile tool you could add to your workshop. In a production shop setting, a router helps you to finish edges and carry out a range of template work. Portable routers, which we will focus on today, offer much more flexibility than the large overhead style. They’re cheap, very user-friendly and can deal with a staggering array of applications. We’ll break down the main varieties for you just below. The list goes on but that should give you a general idea of the sheer breadth of applications where a router comes into its own. The cutter shafts of a router are held by a tapered collet and a locking nut. Changing these is usually done using a pair of wrenches, one to hold the spindle and the other to tighten or loosen the locking nut. Often, you’ll get interchangeable collets for ¼ inch and 3/8 inch cutter shafts. Normally, cutter shafts are made from high-speed steel. For production work and trimming laminate or resinous materials, carbide tips work best. Controlling the depth of cut is very much dependent on the type of base you opt for. Getting this right is crucial. When using fixed base routers, you need to set the depth of cut before you actually start shaping the wood. As the name suggests, this will remain fixed until you choose to reset it. You cannot manipulate it while you are cutting. With the handles positioned close to the bottom of the base, fixed routers enjoy a very low center of gravity. The drawback of this is that you won’t be able to plunge into the workpiece. The height is pre-set which takes the guesswork out of getting the required depth of cut. Fixed routers are best for casual woodworkers and hobbyists. The restriction of moving only up and down means they are best reserved for edging work. A much more flexible router is the plunge base variant. Unlike the fixed base, you can tweak the depth of cut while you’re using it. Thanks to the motor set between the spring-loaded base posts, you’ll be able to make adjustments to the depth you cut without needing to turn your router off. Simply unlock the knob or lever and move the motor housing up or down accordingly. Due to the motor and handles being placed higher up, there’s a high centre of gravity allowing you to plunge into wood with ease. Plunge base routers can feel a little unstable and they certainly require a little finesse. Overall, they can perform much of the work of a fixed base router and much more besides. Plunge base routers are ideal for interior woodworking. If you want the best of both worlds without buying a pair of tools, invest in a combination base router. This 2-in-functionality saves you money while widening the scope of work you can carry out. On the flipside, a combination router will take a little bit more effort to get to grips with. It’s more suitable for woodworkers with at least a little experience. Whether you want to soften edges, divide boards, dovetail, rabbet or carve, there’s really not much you can’t do if you plump for a combo router. ​If you want to add a wood router to your workshop, you really are spoiled for choice. In fact, the number of options can often seem overwhelming. DeWalt have an enduring reputation for making rugged, top-tier tools at extremely reasonable prices. The DWP611PK variable speed router does not break the mold. To be frank, we could have included several DeWalt routers in these wood router reviews but we wanted to offer as broad a spread as possible so there’s something for everyone. The DWP611PK makes a smart choice for anyone just starting out and will also serve more experienced woodworkers operating on a budget. Ready to us and easy to work with! Does a nice job curving wood. Runs a bit loud but not overly loud. Very pleased - it's worth for the money! This DeWalt offers you the advantage of both a fixed and plunge base so you can take care of a comprehensive range of applications in one nifty tool. The fixed base is tailor-made for precise measurements. If you need to cut out pieces from a thicker board, the plunge comes fully to the fore. Changing out the base and bits is a cakewalk with the motor pack easily removable. This router weighs in at a fraction under 5 pounds when you’re using the fixed base. Press the plunge base into commission and you’ll add another pound or so but the DeWalt is still lightweight without compromising build quality or durability. The rubber handles on the plunge base offer superb grip and comfort. Many trim routers have sub-par motors but the DeWalt boasts a 1 1/4HP unit with variable speed. This is dependable and powerful while allowing you a good deal of flexibility in the applications you can tackle. The lower speed of 16,000RPM means you’ll just about be able to work with hardwood although it’s still fairly swift for that purpose so work with care and allow time for cooling down. The upper speed of 27,000RPM is impressive. Another bonus with this motor is its soft start. Not only will this make sure the router lasts longer, it also delivers a consistency of speed throughout the cut perfect for precision work. The pair of LED lights means you’ll be able to work clearly even in dimmer conditions. The transparent base also helps significantly with visibility so accuracy won’t take a tumble thanks to this thoughtful design. 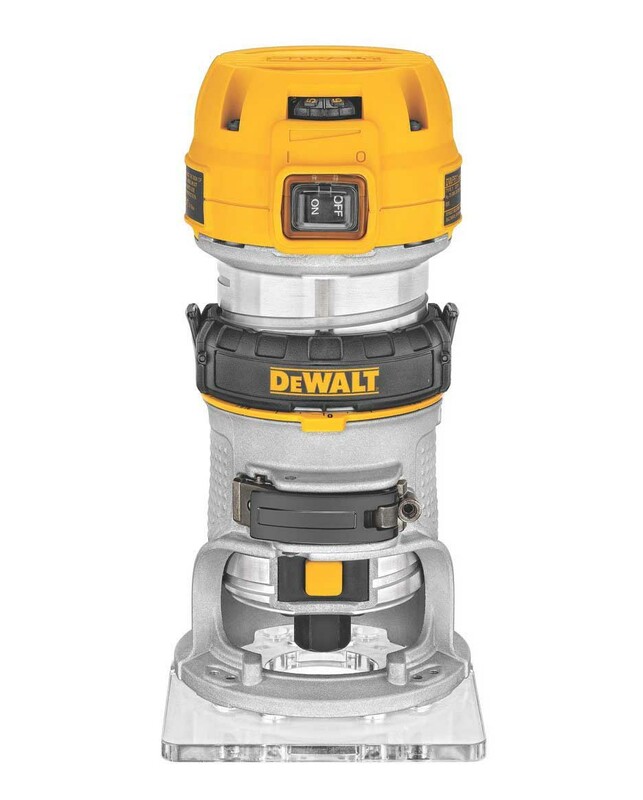 There are 5 depth stops and 12 spindle locks on the DeWalt. You’ll be able to make plunge strokes of 2 inches. You’ll get 1-½ inches of depth travel with the regular base and a full 2 inches with the plunge base. There’s an integrated depth scale for your convenience. With the fixed base, an adjustment ring allows you to fine-tune the bit depth changes to a tolerance of 1/64 inch. The plunge base, by contrast, features a rod for making adjustments. Bit changes are simplified with a large, easily accessible button, shaft lock detents and a spindle lock button. While you can certainly get hold of cheaper trim routers, when you consider the brand heritage you’re buying into and the first-class functionality across the board, the DeWalt DWP611PKrepresents superb value for money. Extremely capable 1 1/4HP motor for a small trim router. Choice of both fixed and plunge base for maximum versatility in one hard-hitting package. Easily adjust speed from 16,000 through to 27,000RPM allowing you a wide range with the slower speeds just about able to deal with hardwood. Soft start motor reduces load and torque when firing up and prolongs lifespan. Electronic feedback from motor ensures a consistent speed throughout the cut. Pair of LED lights to brightly illuminate your workpiece. Weighs just under 5 pounds with fixed base and 6 pounds with plunge base attached so compact and maneuverable. Adjustment ring enables you to control the bit depth change to a tolerance of 1/64 inch. This only works with fixed base in place. 8 slot collet (1/4 inch) for maximum surface contact with shank and a nice tight grip. Outstanding warranty for real peace of mind. The relatively high low speed means you’ll need to exercise care working with hardwood and allow for cooling down. Fairly pricey for a small trim router. Some complaints about small switch-gear. If you want to invest in a dual-purpose portable router that comes in at a pocket-friendly price without stiffing you on performance or accuracy, the DeWalt DWP611PK is well worth further investigation. This compact cordless router will take care of pretty much anything you throw its way at home or on the job site. It’s light enough to use for prolonged periods but heavy-duty enough to last for years while delivering a first-rate experience along the way. The comprehensive 3-year DeWalt warranty allows you to buy without a headache knowing you’re covered for all reasonable faults. Check out the DWP611PK today.It will not disappoint. Next up with our best wood router reviews is a cost-effective and lightweight compact router from Makita, the RTO701C. Since a router comes out to play on such a regular basis, it’s critical that you spend the time and effort to get the best tool for your needs. The RTO701C is an pretty powerful and able wood router at an affordable price that is worthy of a place in any workshop. I love this router. The speed control is great and the slow start keeps it from jerking in your hands when you turn it on. Very easily controlled. I mainly use the plunge router base for now but I expect to use the trimmer base when I laminate some work surfaces for my office I'm building. The Makita falls into line design-wise with most smaller laminate trim routers. The 1 1/4HP motor gives reasonable power in a unit this size. The soft start feature reduces torque on the motor and makes for very smooth running while also guaranteeing you’ll get plenty of service from this router without it letting you down. Where the Makita really scores is in the variable speed dial. Flick from 1 through 6 and choose a speed from 10,000RPM right on up to 30,000RPM at the top end. This means you can exercise a great deal of control over your router while also getting superior results whatever the material or project. Since the speed is controlled electronically, you’ll be able to maintain a constant speed under load. As well as minimizing any twisting, it will also prevent burnout. Like with the DeWalt, you’ll get both fixed and plunge bases if you roll with that package. We strongly recommend doing so to give you the widest choice of applications without needing 2 routers. With the fixed base set up, there’s a locking lever and an adjustment ring to help raise and lower the router. This translates to perfectly precise cuts each and every time. For adjustments, you’re limited to an oversized lever for depth setting. This is positioned on the front face of the Makita’s base. Fine adjustments are slightly awkward since the motor will plunge as soon as you open the lock lever. The lack of friction makes things rather fiddly and means you’ll often lose your reference position which can be frustrating in the extreme. While this shouldn’t make or break your buying decision, it’s worth being aware of. There’s a crude scale on the motor unit for an overall sense of depth. Unfortunately, there’s no movable pointer here rendering it little other than a general and vague guide. You’ll get a metal parallel guide with all iterations of the Makita. This is mounted to the rear with a thumb screw. Using this, you’ll be able to make cuts up to 3 ½ inches from a board’s edge. Instability can take effect when you’re making too deep a cut, running the router too rapidly or the bit’s too large. In fairness, these are general issues that plague routers rather than a specific fault of the Makita. Dust collection leaves something to be desired. All the dust is blown forcefully out the bottom. You’ll need to purchase a shroud in order to hook this router up to your dust collector so factor this into your budgeting. The more expensive models do include this shroud free of charge. 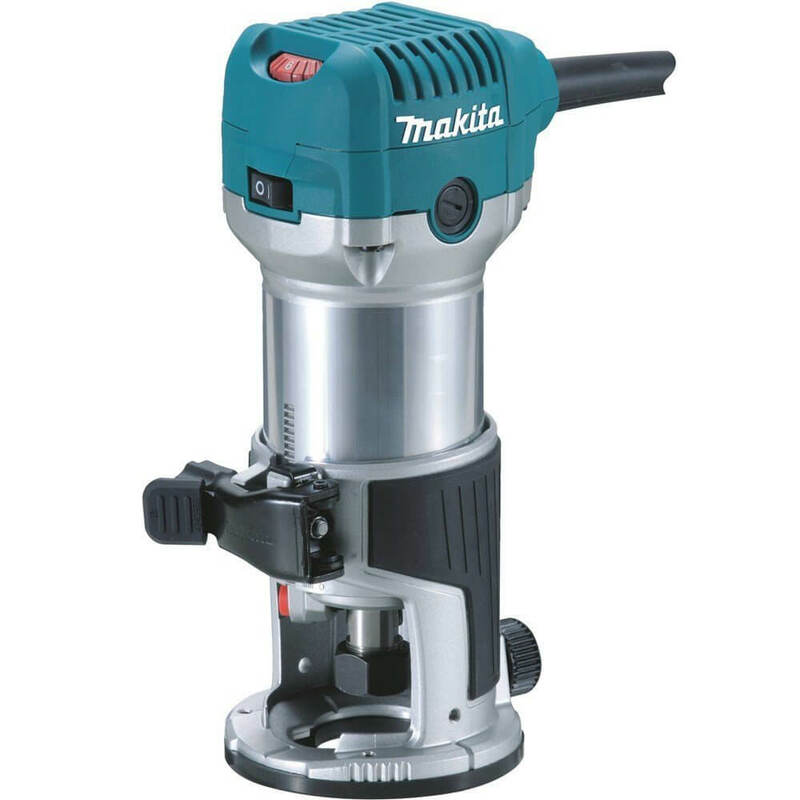 Overall, the many advantages of the Makita RTO701C more than compensate for the downsides. We only mention this so you can choose to buy with your eyes wide open rather than being ambushed by flaws you weren’t aware of. Brisk 1 1/4HP motor has wide range of speeds from as little as 10,000RPM through to an ultra-rapid 30,000RPM. Electronic speed control delivers a consistent speed throughout. Available as bare tool, with 1 base or 3 base so something to cater for all woodworking needs. Soft start makes things run super-smoothly while also extending the life of your router. Slimline design takes up little space in the workshop and gives you maximum control. This router is the ideal mixture of power, size and overall agility. Make depth adjustments and swap out the base easily thanks to quick-release cam lock. Brushes accessible from outside for your convenience. Work with absolute precision with the bits running perfectly true. No adapter for template guide so you’ll need to buy this separately! Motor is not enormously powerful but it gets most normal jobs done without straining. You won’t get any LED lights. Locking level needs to be held down. Whether you’re a home woodworker, a carpenter or contractor, the exceptional build quality of this neat little wood router means it will dole out precise cuts and more than adequate power combined with the utmost reliability. This router is rated for prolonged and heavy-duty work. Overloading is pretty near impossible under most reasonable circumstances. It warms up slightly if you really work it hard so make sure to take plenty of breaks to sidestep overheating. For a top-tier router that doesn’t cost the earth, we’d strongly recommend testing the Makita at your earliest opportunity. Next in our best wood router reviews is a fixed base model from the mighty Bosch. Where these small tools were once known only as trim routers, they have evolved into palm routers capable of a great deal more than just trim work. Great lightweight palm router. Good power for it's size, variable speed, easy set up, usable case - Overall a good product. After you've used it for a while, look into the plunge base, and you'll find you're using it more and more. The edge guide and the case were the only negatives I've found. Although the Bosch only packs a single horsepower engine, it punches above its weight. You’ll enjoy a surprising amount of torque along with more than sufficient power for any small woodworking and trim projects whether at home or in the shop. The soft start functionality helps to lessen torque and deliver consistent speed. This is further enhanced by Bosch’s proprietary constant response circuitry so you’re protected from any overload while also assured of a regulated speed under load. Thinking of speed, you’ll be able to tweak the Bosch anywhere from 16,000RPM up through a maximum of 35,000RPM. The lower range – marked 1 to 3 on the scale – serves up a band from 16,000 to 20,000. This is ideal for large diameter cutters and bits. You’ll enjoy more control and less friction at these speeds. Moving up from 4 through 6 on the scale, you can ramp things up from 22,500RPM to the top end of 35,000 for smaller bits and cutters. This will serve you well for dovetailing and rabbeting with softwoods. The depth stop with 7 steps allows you to make big and small tweaks. You’ll need to pay more for the plunge base so don’t expect both styles with the basic variant. Fine-tuning with the fixed base model is a cakewalk. First, align and lower the motor. Use the clamping level to lock the router in place. Use the wheel at the rear to make small adjustments. Like everything else on the Bosch, this is very user-friendly so you won’t need to be a woodworking expert to get the very most from this router. The straight edge guide is a nice bonus and you’ll also enjoy a couple of wrenches tossed in. Most routers in this price range come as bare tools with no frippery so it’s a welcome bonus to get these extras with the Bosch PR20EVSK. Whether you’re trimming planks, edge forming, dovetailing or making cutouts in windows and decorative overlays, it’s remarkable just what you can get from this agile little router. Deceptively torquey 1HP engine offers more than serviceable performance in a very compact unit. Excellent range of speed from 16,000 to 35,00RPM catering for many applications and materials. 7-step adjustable depth stop for fine-tuning on the micro and macro level if you invest in the plunge base. Scales read in metric and imperial to save time and mental measurement conversion. On/off switch is the rocker style so extremely easy to activate. Hard case thrown in so great if you’re using the Bosch on the job site. Contoured grip is comfortable and allows for precise control. Not ideal for use on a router table. Spindle lock button is tough to operate. No dust cover which is a disappointment. No side handles but that’s common to fixed base routers rather than a particular flaw of the Bosch itself. Plunge base costs extra so consider this if you need dual-functionality. Although the entry-level fixed base model won’t offer you a plunge feature, you can pick this up at a reasonable cost if you want your Bosch to serve double duty. Overall, for such a compact and relatively inexpensive router, we’re amazed at the build quality, attention to detail and raw performance delivered. If you’re looking for a solid, dependable router offering precise and powerful results, road test the Bosch PR20EVSK today. With a 1-year limited warranty, straight edge and hard case thrown in, you really can’t expect much more at this price. 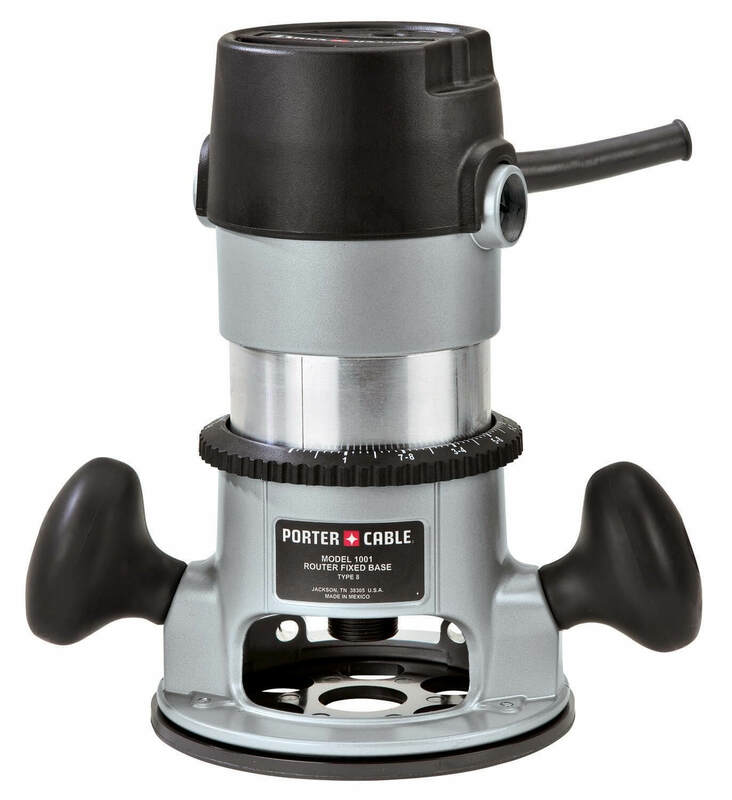 Our penultimate suggestion in these wood router reviews is a more limited tool from the highly reputable PORTER-CABLE. The 690LR features a single speed motor and is a fixed base so it doesn’t have quite the range of the other offerings on this list. The thing is, every woodworker has differing needs and we wanted to provide something for everyone. I've been using a 690 in my shop built router table for the past 6 months on an almost daily basis and it hasn't skipped a beat yet. It's powerful, very reliable and the build quality is fantastic. No unnecessary plastic here. The router has a good heft and feels great when hand routing too. This model used to have phenolic handles, which could get uncomfortable during extended use, or slippery if a pair of sweaty hands got ahold of them, but the handles on the latest version are more rounded and rubber coated. They feel great. PORTER-CABLE don’t make the cheapest tools you can find but the quality is first-class and this 690LR fixed base router is no exception. This router is exceedingly user-friendly so, even if you’re just starting out on your woodworking journey, you’ll be able to get going more or less straight out the box. The 11-amp motor develops 1 ¾ peak horsepower and delivers enough power to work with even harder woods. The single speed nature of the PORTER-CABLE has its advantages and drawbacks. The high velocity of 27,500RPM is perfect for most applications but you won’t be able to make those valuable adjustments when you feel the need to dial things back. The silver lining of the single speed is a guaranteed consistency of cut that’s often hard to find with variable speed alternatives. You’ll work in comfort while assured of precise cutting thanks to the non-slip handles. There are plunge and D-handle bases available at extra cost if you want to widen your scope of work. This is something not usually available with fixed base routers. Depth adjustment is straightforward and you can hone things to a tolerance of 1/128 inch which ensures micro-fine tweaks you can carry out without needing a PhD. User-friendliness extends across the board with the PORTER-CABLE which is one of its principal selling points. There’s nothing worse than a potentially great router marred by fiddly controls or complicated procedures. This router is ideal whatever your level of expertise. For changing the bits, you will need to press 2 wrenches into commission. These come included so at least you won’t need to go out and buy them separately. Although you’ll get a hard case chucked in, it’s got room for precious little bar the router. There’s also no on-board storage so you might want a little box to keep your accessories and necessities in to avoid misplacing them. PORTER-CABLE offer up a 3-year limited warranty and a year of free servicing. As if this wasn’t enough, you’ll even enjoy a 90-day grace period when you can get a full refund if the router doesn’t live up to your expectations. This all combines to remove most reasons not to buy this delightful piece of kit so what are you waiting for? Very powerful 11-amp motor kicks out 1 ¾ HP. Tips the scales at under 10 pounds so a lightweight and ergonomic cutting solution. Pair of non-slip handles are comfortable and allow to you to control the router with ease promoting accuracy and precision. Single speed motor generates an impressive 27,500RPM and maximizes consistency. Neat lock-on button allows Works a treat on a router table. Option to buy both plunge and D-handle bases separately which will offer you further versatility without breaking the bank. Depth adjustment system accurate to a staggering 1/128-inch. Auto-release collet system renders changing your router bits a walk in the park. Sealed power switch stops dust and debris getting inside your router. Under-table stop function keeps the motor secure and lessens the likelihood it will rotate out of scope. Need to use 2 wrenches to swap out the bits. A single speed router so make sure you’re comfortable with this limitation. The case is an extremely tight fit so you won’t get much else inside. No on board storage is a disappointment. For a rugged and hard-hitting router that will stay the distance at home or in the workshop, the PORTER-CABLE stands above many rivals and is a definite candidate for the best router in its class. By focusing on both power and efficiency and not charging a fortune, this fine router earns it place on any shortlist if this is the kind of router that would best gel with your personal requirements. Go and check out the 690LR and, if you genuinely don’t get on with it, simply claim a full refund. We don’t think, though, you’ll be taking PORTER-CABLE up on that offer once you have this router in your workshop! We’ll wrap up our best wood router reviews with a much more expensive option for the connoisseur, the 574368 modular trim router set from the legendary Festool. This German company make premium power tools with a sharp focus on dust extraction, build quality and precision. 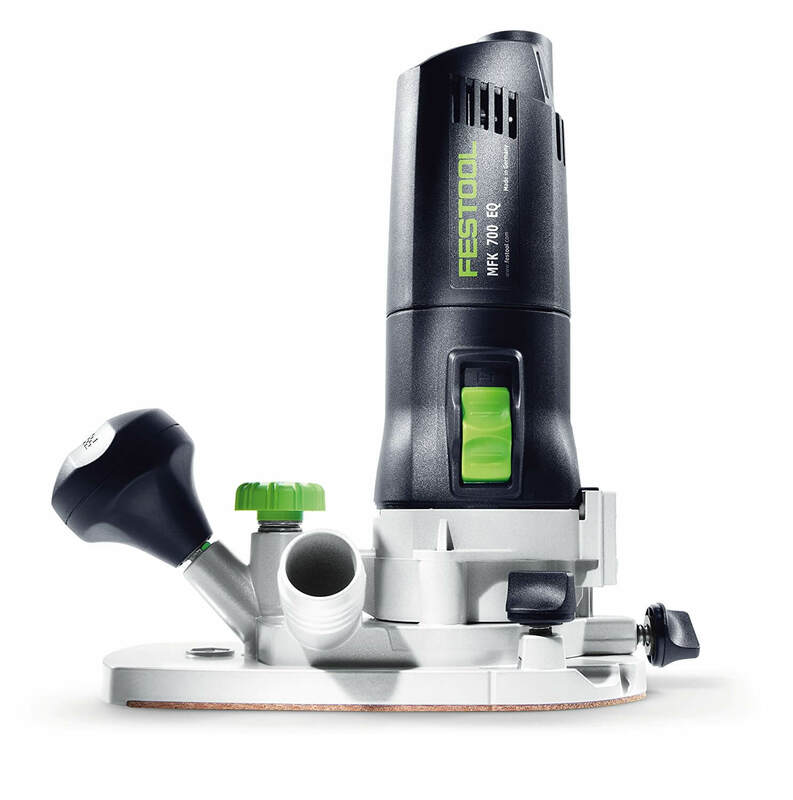 Festool products are not cheap but then the best things in life seldom are. It’s certainly not for everyone but a tool like this finds its own market. Read on to see whether or not you consider this router set is worth the investment. I don't think I need to tell you what this thing can or can not do. There are plenty of great reviews on here as well as great Youtube reviews. This router saves me time and money just like every other Festool I own. All Festools may cost twice or three times the amount of other tools, but every single Festool has paid for itself on their first job I have taken them to. The first thing to clarify before we kick off is that this Festool router is exclusively an edging router. You won’t get the same range of applications at your disposal as with the other palm routers we’ve investigated. That said, this router performs that one set of tasks exceptionally well so, if it’s edging work you’re engaged in, this is the perfect solution. If you’re looking to rout grooves, trim up laminate or undertake some edge banding, this router is expressly designed to make things easy for you. The motor is only 1HP but it’s more than fit for purpose. Multi-material speed control stops overload while producing optimum consistency under load. Despite its heavyweight performance, the Festool weighs just 4.2 pounds so it’s a winning mixture of portability and power. While you can buy the router on its own, the set is the superior option. With this, you’ll get collets, a wrench and a pair of bases included for bumper value. You can seamlessly integrate this router with any other Festool kit you have in your workshop for professional results that get better with each additional tool you hook up. Dust blights any workshop and Festool place a premium on removing this menace. There’s a neat dust port so you can connect your router up to a collection system and work away in safety with a clear line of sight on your workpiece. Depth control, as you would expect, is top-tier. You can make adjustments down to 1/256-inch which makes this router hard to beat in this department. The pair of bases, both vertical and horizontal, allows you to exercise absolute control over depth when you’re trimming edge banding while safeguarding the surfaces at the same time. This is a wonderful feature not matched by competing routers. The support offered by the base takes all the sting out of projects like trimming laminate. You’ll get outstanding stability and the substantial hand knob means you can keep your router firmly in place. Most woodworkers don’t buy a single Festool product but aim for a shop containing many of their tools which all work in sync. If you’re looking to start your collection somewhere, though, this modular trim router is a fantastic place to begin. Although you won’t get the flexibility that many cheaper routers manage to deliver, when it comes to trim work and edging, this tool stands alone. A truly unique router with both vertical and horizontal bases, if you decide to roll with the Festool, you’re highly unlikely to find anything much to complain about. If you’ve got the budget to spare, we stridently urge you to give this router a shot. A wood router is indispensable for any woodworker or DIY enthusiast. 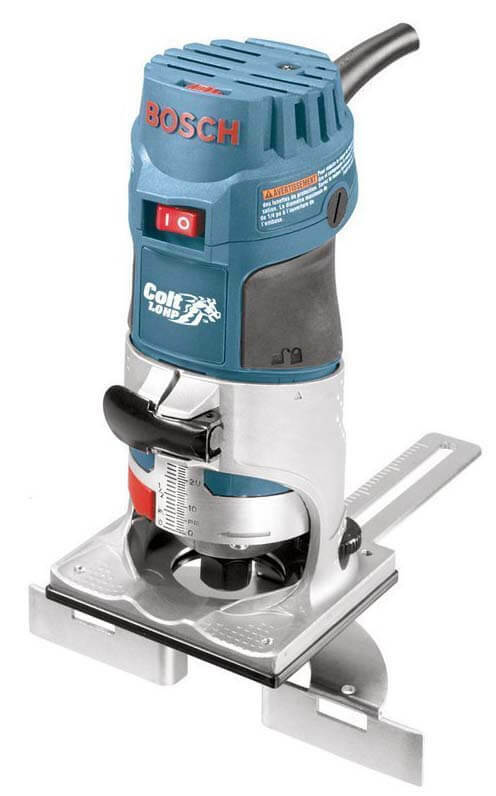 If you ever have call to hollow out areas of wood, plastic or metal, these wonderful power tools are second to none. Whether you want to cut out edges or grooves, patterns or decorative moldings, there is nothing like a portable router to get the job done quickly and to stunning effect. You’ll be able to round off edges on your furniture, bevel picture frames or even make signs with a router so you’ll be spoiled for choice. From cabinetry through to jointing, rabbeting and an assortment of trim work, the best wood router is equally at home in your workshop or on the job site. In fact, a more accurate question might be, “Who doesn’t need a wood router? 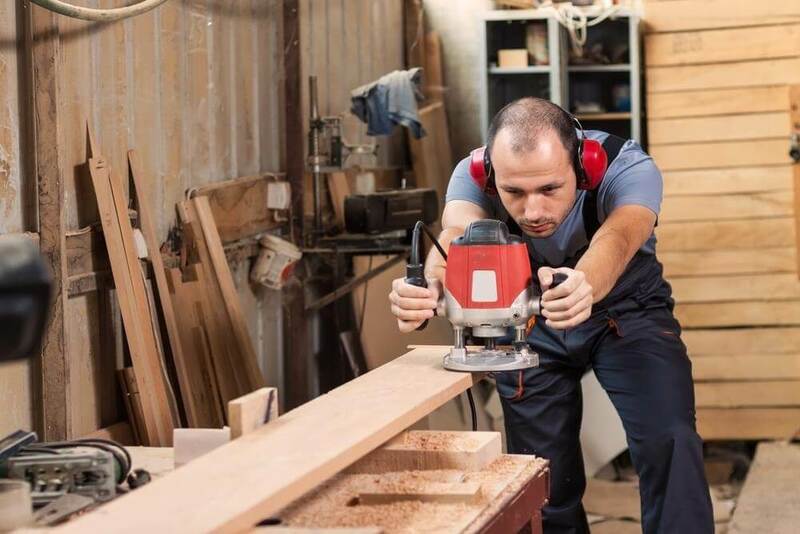 As with any power tool, there are a number of key points to double down on so you can end up with the most suitable piece of kit for your needs. If you’ve decided on the type of base that would work best and generally absorbed plenty of information on routers, we’ll give you some advice in this brief buying guide that will help you focus on what counts. Price always plays a part in any buying decision but, with power tools, it should certainly not be the only factor you consider. Bear in mind the old saying, “Buy cheap, buy twice.” This is not to say that you need to max out your credit cards or put yourself in financial jeopardy. You should, though, get the best router you can afford which meets all your requirements. Read plenty of impartial reviews and visit online forums as well as genning up on user feedback. Use whatever resources you can to build up a clear picture of the pros and cons of any wood router you have in mind. The first choice you’ll face concerns the base. If you’re just starting out, a fixed base router is a smart choice.You’ll need to set the depth of the blade before you begin cutting and you won’t be able to make any adjustments when your router is running. These lightweight routers are perfect for making edge cuts and molding. You’ll get less control but you can attach these routers to a table fuss-free. Plunge base routers are similar in design. With these, you can still set the cut depth but, as you plunge the bit into the cut, the router base will lie flat on the surface of the workpiece. This allows you to go deeper into the wood and you can make adjustment while you’re working. These plunge style routers are perfect for interior woodworking. For a win-win, you can opt for a wood router with both a fixed base and plunge functionality. A 15-amp motor is all well and good but if you use your router at the highest available output for extended periods, you risk burning it out. As with all aspects of buying a wood router, there’s no right or wrong answer. Think about exactly what sort of projects you want to undertake and make sure you opt for a motor in line with those needs. The majority of the routers we reviewed are variable speed and with just cause. Being able to increase and reduce the speed according to the material makes for easier operation and gives generally superior results. You’ll also be better placed to deal with knots and knobs on the workpiece more effectively. The greater the spread of speeds, the more control you’ll exercise so scope out routers with a nice wide variable speed. Consider both the cutting depth of the routers you have in mind and also the ease with which you can make adjustments. Look for models with levers or clamps on the side to simplify what can be a tricky procedure. Router bits come in a staggering array of shapes and sizes to suit all applications. From beading to chamfering, rabbeting to coving, pay careful attention to the type of work you’ll be undertaking and focus on getting the right bits for the job. ​You can buy yourself a router table which allows you to secure your tool bit up so the wood can slide neatly across the table and onto the bit or blade. You can buy a freestanding table or one that sits on your existing workbench. These tables serve to transform your router into a shaper and spindle molder so if you’re looking to take on projects like this, investing in a good table makes sense. While not all routers have a spindle lock and it couldn’t be considered a deal-breaker, it’s worth looking for models with this feature. Swapping out the blades and changing the settings is simplified with a spindle lock. Consider this the icing on the cake rather than a crucial component. 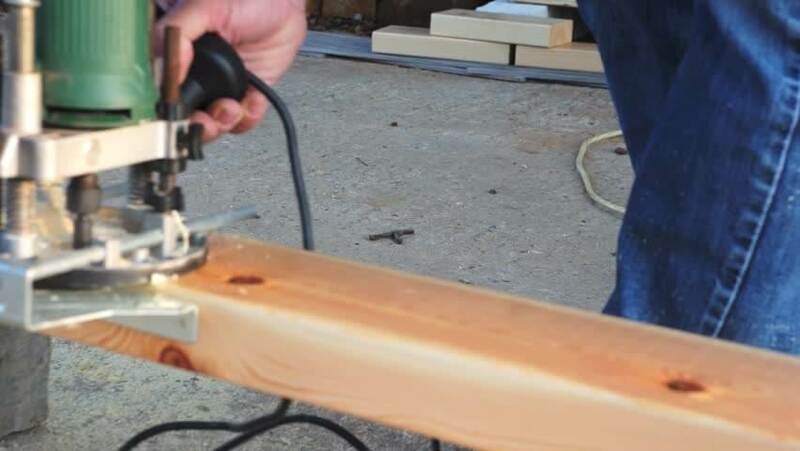 Fortunately, the wood router is among the safest and simplest portable power tools to use. As with any tool, keeping it clean and dust-free is imperative. Pay close attention to any ventilation holes and make sure to clear away any shavings from these areas. When you’re not using your router, it’s wise to store it either on a high shelf or inside a cabinet. Check the collets on a regular basis for any burrs or grit. You should also clean them from time to time using thinners. If you’re not using the router, it goes unsaid you should turn it off. This is particularly critical when you’re making adjustments to the depth of cut. When it’s time to change the cutters, always unplug your router. Always hold your router firmly with both hands. Feed the cutter carefully and methodically. If you feed too quickly or make excessively deep cuts, you’ll end up overloading the motor and taking longer to get an optimal finish. You can get a sound idea of the feed rate you need by listening to the sound of the motor. Admittedly, this is not something you’ll be able to do straight off the bat but it’s a skill you’ll swiftly master. Avoid dull cutter bits at all costs. They’ll cause overload and lead to shoddy results. On the maintenance side of things, wood routers are blissfully easy to take care of. Aside from cleaning and occasionally tightening the screws, all you’ll really need to do is occasionally inspect the brushes for wear and tear then replace them according to the manufacturer’s instructions as required. Follow these simple pointers and your router experience should be stress-free. We vIf you don’t yet have a router in your toolkit and you have more than a passing interest in woodwork, it’s time to set that straight and add one to your arsenal. We very much hope you’ve enjoyed these wood router reviews and found some useful tips to streamline your buying process. If you take the above information into account and honestly analyze your needs, it’s really pretty simple to get a router to last you for years to come. Feel free to drop us a line with any queries or feedback. We’re always very happy to hear from our readers and this site reflects what we’ve been asked to investigate. We’re continuing our expansion so get in touch if there’s anything you’d like us to cover. 1. HOW DO I GO ABOUT CHOOSING THE RIGHT BITS FOR MY ROUTER? As a general rule, buy bits from established manufacturers. Start off with some trim bits, pattern bits and roundover bits. Invest in the best quality bits you can afford and build up a collection over time. 2. WHAT IS A STRAIGHTEDGE USED FOR WITH A ROUTER? This is the most common way to make sure you get straight, accurate cuts for grooves and housings. Simply nail or clamp a straight board to your workpiece then run your router against it. 3. WHAT IS A STRAIGHT GUIDE? This simple accessory screws or bolts onto the edge of your router base. The straight guide will run against the edge of the workpiece and direct the cutter parallel to it. 4. WHAT IS A TRAMMEL BAR? This accessory is used when you want to cut out grooves or circular shapes. These can be internal cuts like cutting out for sink or external cuts, for example cutting out round a tabletop. 5. IS IT POSSIBLE TO USE A TRIM BIT IN PLACE OF A PATTERN BIT? If you plan to cut lots of patterns, it’s worth picking up a dedicated bit. You can, though, use a trim bit to for pattern work. The only different between these bits is the location of the bearing so you can certainly make do and mend. 6. WHAT IS CLIMB CUTTING? Climb cutting is when you need to make small cuts in the opposite direction. Since the bits are designed so they cut into the flow of the wood, climb cuts are often poor quality. It’s normally not a good idea to try routing your workpiece in reverse. 7. HOW OFTEN DO COLLETS NEED CHANGING? If you are running your router in a commercial settings for 8 hours a day, you’ll need to swap the collets out perhaps 2 or 3 times a year. Scale this down accordingly if you are a home woodworker. 8. WHAT’S THE BEST WAY TO HOLD DOWN THE WORKPIECE? Clamping the material to the bench is effective but can also be restrictive. You can pin down the wood if you can pin holes in a waste area. You can even use double-sided tape for holding templates and jigs so experiment and find out what works best for you and the project you’re working on. 9. WHAT IS A BOX GUIDE? This guide controls the movement of your router in all 4 directions. It’s designed for making internal cuts for the slots in through tenons, recesses and cutting stopped housing. You can make your own quite easily and accuracy is absolutely paramount with this guide. 10. WHAT IS TEMPLATE ROUTING? 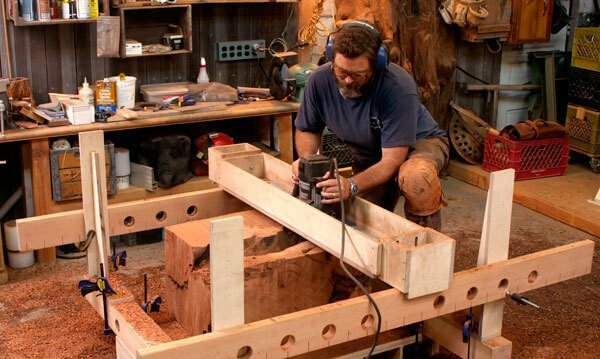 Put simply, this is an elegant way to use your router to cut repeated shapes from a jig or master template. Build up a collection of templates over time to expand your woodworking horizons and get more done in less time.